Alastair Seeley pictured with EHA Racing team boss, Edward Allingham, David Shirley of J.P. Corry, Coleraine, and NW200 Event Director, Mervyn Whyte. All-time North West 200 record holder Alastair Seeley will be gunning for back-to-back Supersport doubles on the EHA Racing Yamaha in 2019. The Carrick rider recently struck a deal with the team to compete in the British Supersport Championship next season and Seeley will also line up on the YZF-R6 for his sole road race outing on the north coast, where he will be supported by Coleraine building suppliers, J.P. Corry. The 39-year-old clinched three more victories around the 8.9-mile Triangle course this year to extend his unprecedented haul to 24, adding a Superstock triumph on the Tyco BMW to his 600cc brace. Seeley will be bidding to chalk up a remarkable quarter century of North West wins next May at the 90th anniversary of the international road race, which will take place from May 12-18. Former two-time British champion Seeley said: “I bonded well with the team and the bike last year and am delighted to have a deal sorted for the British championship, which means I should hit the ground running coming to the North West. “We will have the first two British rounds at Silverstone and Oulton under our belts by May and should be up to speed and have the bike well sorted. “I am training twice a day, six days a week, to make sure I am as fit and sharp as I can be. I always think it is important if you can come to the North West carrying confidence from the British championship,” he added. Since he made his debut at the North West 200 in 2004, Seeley has written his name into the history books. As well as setting a new overall record for the most victories at the event, he has managed to win a race every year since his maiden success in 2008. EHA Racing team boss and former North West competitor, Limavady businessman Edward Allingham, said he jumped at the chance to return to the North West with Seeley after this year’s memorable double for the team. 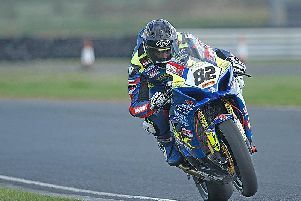 “We would love to be able to give Alastair his 25th win at the NW200,” said Allingham. Event Director, Mervyn Whyte, is delighted that Seeley and the EHA Racing team will again compete at the North West next May. “Alastair continued his winning ways at the North West with Eddie’s EHA team last May and it is great news that they will be back together again with local sponsor J.P. Corry for our 90th anniversary races,” said Whyte, who is expected to step down from his role following the 90th milestone meeting next year. With a deal in place for the Supersport category, Seeley will now switch his focus to securing Superbike machinery. He rode for the Tyco BMW team in the Superbike and Superstock races this year and the wily Ulster rider is confident he will have top-spec machinery at his disposal once again for the 1000cc classes in 2019. “I have a few offers on the table at the moment and I am not rushing into anything,” he said.